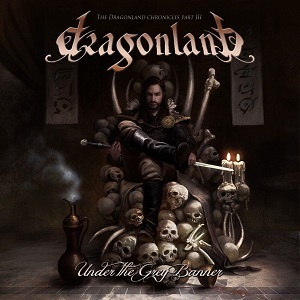 "Under the grey banner" is the latest album from Swedish symphonic power metal band, Dragonland. It's been a long wait for their fans with their last album (Astronomy)having been released. The new album is a concept album relating to mythology and fantasy. As well as the band members, the album features some guests - Musical actor Fred Johanson (Jesus Christ superstar) and all three singers (Elize Ryd, Jake E and Andy Solveström) from Olof Mörck's other band, Amaranthe. Fans should definitely visit the band's website, http://www.thegreybanner.com/ - its been done as a map of "Dragonland" with various places relating to the album highlighted that you can click on for the mythology and videos. It's beautifully done to tie in with the new album and is well worth a visit. Right, thats the concept part out of the way, now what about the music? Well that's just as impressive as the concept. It's rich and grandiose and is perfectly suited to the concept. You've got great power metal songs with symphonic orchestral sounds which build up the drama in the same way they do in a movie such as Lord of the rings. I'm not going to try and pick out individual songs to comment on - this is an album that works best listened to as a whole. All the songs are strong, have great music and lyrics, and I have to say, this is probably the best concept album I've heard in recent years. Often they simply dont work very well, but this one works perfectly. Power metal is often associated with fantasy and mythology with its lyrics, and with "Under the grey banner" Dragonland have taken this to the obvious next level. If you like power metal then this is a must-have album. "Under the grey banner" is due for release on 18th November via AFM records.